Why are Porcelain Tiles the Most Preferred Option for Kitchen Flooring? Hard, durable, water and stain resistant – these are the words that indeed cross your mind when you think of the option of tiles for your kitchen flooring. Not to forget, the floor tiles are meant to look naturally attractive too. So, the primary factor you need to concentrate on is the quality of the tiles you are choosing. The variety of tiles that most of the property owners choose for their kitchen includes ceramic tiles, porcelain tiles and stone based tiles. Evidently, each of these types has different compositions. If we keep the stone floor tiles out of this list and concentrate on comparing the porcelain and ceramic tiles based on a few attributes, it will be seen that porcelain tiles are a much-preferred choice for most of the people. Do you need to know the real reason for this popularity? Here are some of the factors involved for this choice as shared by our experts of tiles in Perth associated with Direct Tile and Bath. Read on to find out. Other than just saying that porcelain tiles are a better choice than the ceramic tiles, let’s prove it! Look at the composition of both the tiles. Ceramic tiles are made of the perfect mixture of clay and sand whereas the porcelain ones are also made of similar elements but just with more refined ones. Strength is one of the most prominent attributes of the porcelain tiles. So, you can actually stay out of fear that the porcelain tiles will be damaged in any way if you accidentally drop a heavy jar. It’s just perfect for both moderate to heavy foot traffic that is quite common for any kitchen. Just like your bathroom floors, moisture is quite common in kitchen areas too. And, porcelain tiles evidently absorb less moisture compared to the ceramic tiles. Whether it is coming from the humid ambience of your kitchen or accidental spills, the porcelain tiles are the way to go. Our range of floor tiles in Perth, especially the porcelain tiles actually have a layer of shiny coat that resist the spill to cross the surface level. And, these tiles are equally valid when it comes to stain absorption. So, there is no way that you have to do any struggle with these particular floor tiles. Is the Cost too high? You may hear a lot of people complaining about the cost of the porcelain tiles by comparing it to the ceramic tiles. That’s not fair, of course! 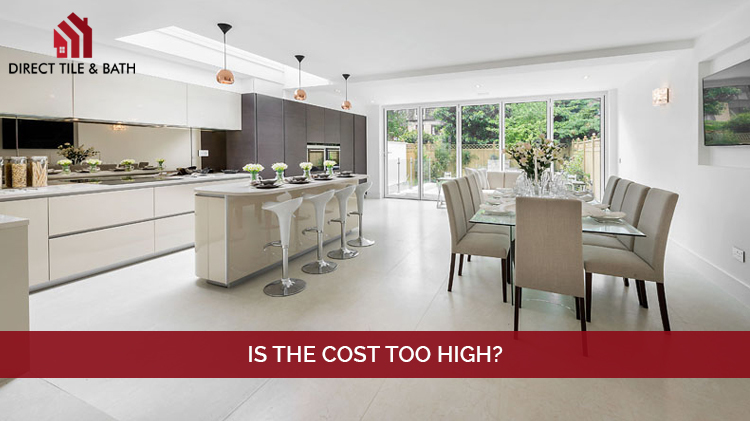 It is true that the price of porcelain tiles is a bit high compared to other floor tiles. But, considering the attributes the porcelain tiles have, you cannot stop yourself from opting for it. And, most importantly the cost is never ‘too high’. Instead, you just need to pay a bit more price to secure a perfect look for your kitchen. It is a perfect floor tile option for any of type of kitchen areas. Be it residential, commercial or industrial kitchen; the porcelain tiles are compatible. Check out the wide variety of porcelain floor tiles available in the store of Direct Tile and Bath and go for a kitchen renovation.